To many people who do not understand greenery and the beauty that it brings to a setting, this variety of Live Ivy Topiary plant will change their minds. Far from the boring green leaves that most people envision, this plant is a visual explosion of color and pattern in an ivy plant. For those looking to make a big impact in a small area, this variation of Fresh Topiary is the answer to keep the skeptics at bay. This type of Live Ivy Topiary has a lot to offer it's surroundings. The variation in the colors within the leaves will blend in with nearly any decor. The 4.25" pot allows for easy placement on a shelf, desk, or shaded windowsill. The new chutes of vines that emerge from the center of the plant come out in an awesome display of brand new purplish leaves with bright contrasting white edges. The vines are sturdy and once they are developed, they are very hearty and strong. The included plastic pot is a shading example of green on the bottom and fading into a stark white at the top of the container. This color variation only helps to enhance the incredible color contrasts within the Fresh Topiary. When considering this type of Live Ivy Topiary, it is important to take into consideration where the ivy will be housed. This type of ivy topiary desires temperatures that are kept between the area of 40-80 degrees Fahrenheit and out of direct sunlight. The Live Ivy Topiary loves the bright light but will burn if left in the direct path of the sun's damaging rays. When the soil becomes dry it is necessary to water the plant sufficiently. This requires a delicate balance as the over watering of this type of Live Ivy Topiary will flood the roots and drown the plant. If over watering does occur, it is essential that all water be allowed to drain out of the container and that all excess water be dumped from collection plates and pans. Checking the soil moisture level every day will eliminate the chance of an oversight in watering needs and killing your Live Ivy Topiary. When purchasing these Live Ivy Topiary plants, it is important to note that there are a few extras that you can take advantage of before you checkout. 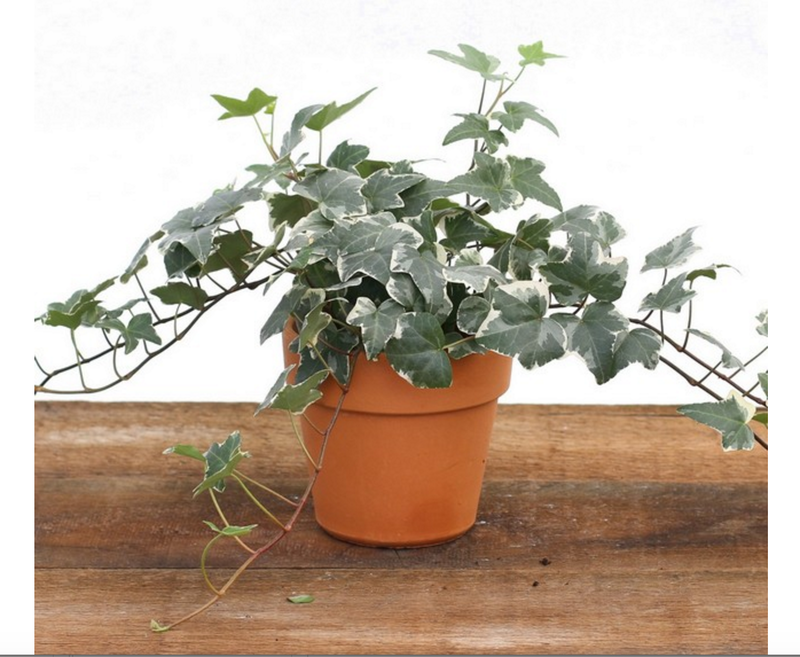 These incredibly light .55 pound ivy plants are the perfect solution to a gift giving dilemma. You can upgrade the potting container to a 4.5" Terracotta pot, you can have the plant wrapped in a sheet of Mylar, or both. The Mylar wrap not only adds an element of security against the leaking of the plant, but it adds a visual element of elation to the recipient when given as a gift. It doesn't matter if the purchase of this hearty Live Ivy Topiary is for an addition to an outdoor area, an indoor desk, or to be given as a gift, this incredibly colorful variation of Live Ivy Topiary will bring instant focal attention to any area.